Well, I've been away for awhile. We've been enjoying summer and just plain busy! But I do plan to get some more updates on here a little more regularly now. First, some blog news. In case you only read my updates via e-mail or a reader, you might want to stop by sometime and see the change I've made. Things are looking kind of nice, if I do say so myself! My intent is to be more a little more "uptown" like some of those nifty food blogs I like to read. I'm planning to take photos of the food I make (I'm no professional, so please forgive my amateurish attempts!) and to have fun with those photos by making them look kind of scrapbooky. So I hope you like the changes! Now for an update on JD and our diet. I'm no longer nursing and am eating dairy. Yay! It was a long 16-plus months of no dairy/soy, but I'm living proof that it can be done! I must admit, it's been nice getting to eat those forbidden foods again! However, JD is still touch-and-go when it comes to dairy -- he's OK with soy -- and I'm still cooking our family meals sans dairy. So don't worry, I'll still be putting new recipes here! Anyway, hope you all are having a great summer! We are here in Omaha -- as can be seen in the photo below. 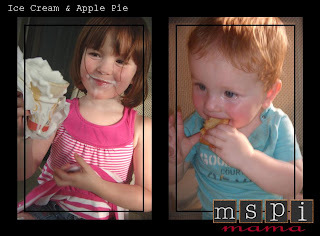 Libby's eating McDonald's ice cream, and JD's chowing down on a McD's apple pie -- yes, those pies are MSPI-friendly! I can't wait to see the new recipes WITH pictures!!! My dd is 4/12 and we found out last October that she has a dairy allergy. I've suspected it from the beginning but a test at 14 months came back negative. Going dairy free was a HUGE change for us. I think it was harder for my husband and I, more so than her. Ha! Always look forward to your updates. Thank you!! Love your new uptown look! I haven't been by lately because I stopped nursing Logan. We've had him on hypoallergenic formula and soon will slowly introduce a soy based formula to see how he does. I'm looking forward to that because hypoallergenic is SO EXPENSIVE! In hindsight I would have continued to nurse him longer, but I was going back to work & seflishly missing dairy. Funny thing, a week after I committed to going back we found out we are pregnant again!! I'm praying baby #3 does not have mspi. But I feel good knowing I have a great resource to turn to if that happens to be our fate. Keep up the great work! Your kids are ADORABLE! Great to hear from you, Jamie! I hope the soy formula works out for your little guy. Congrats on baby No. 3!!! a friend showed me your blog and i'm so, so thankful! my first son (Isaac is almost 2) was MSPI, AND i couldn't eat beef cuz that bothered him just as much. now my second son (Christian is about a month) seems to have MSPI and something else that bugs him that i haven't been able to figure out quite yet. I had a small cookbook from before but the same things over and over get boring. It's so great to have 1 place with LOTS of receipe's to try. thank you so much for putting your time into this. it means so much to me! Glad to be of help, sarah jake! Good luck with everything! Are you serious??? McDonald's fried apple pies are MSPI friendly!!??? I've got to see if K will eat those! He's sooooo picky...drives me nuts. I still love your blog! Oops! For some reason the entire address didn't publish. Let's try again.